Four men accused of carrying out the spectacular heist of a giant solid gold coin worth €3.6m from a Berlin museum are to go on trial on Thursday. The men stand accused of stealing the 100kg “Big Maple Leaf” from the Bode Museum after using a ladder to enter a third-floor window, smashing the bulletproof cabinet in which the coin was on display, then transporting it in a wheelbarrow to a nearby park and abseiling with it to a getaway vehicle. The theft in the early hours of 27 March 2017 stunned the German public, not least because of its audacity and old-fashioned simplicity, and the fact that no alarms were triggered in the museum. Three of the men on trial, identified according to German custom only as Wissam R, Ahmed R, and Wayci R, are members of a Berlin crime family. The fourth is a security guard identified as Denis W, who is accused of assisting the men by providing them with information about the museum which was vital to the plot. The coin – 53cm in diameter and 3cm thick – was on loan to the museum from a private owner, one of only five pure gold commemorative pieces issued by the Royal Canadian Mint in 2007 and bearing the face of Queen Elizabeth II. 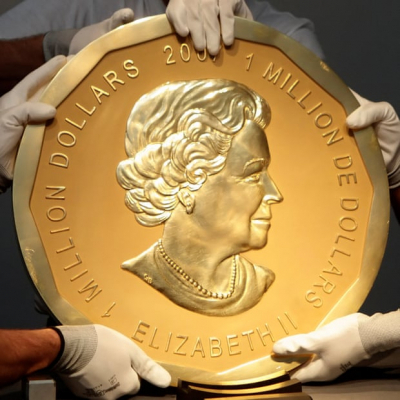 It is legal tender and was marketed as the world’s largest gold coin by the Canadian Royal Mint, worth 1 million dollars, but valued at €4m Euros according to the value of gold at the time of its theft. Its value at today’s gold spot price would be €3.6m. It is believed to have been broken up and melted down shortly after the theft and it is thought it will never be recovered. Detectives revealed early on in the investigation that the “R” family was part of a crime ring well known to police and whose members had carried out numerous high-profile crimes over several years, including break-ins, a bank robbery in which the bank building was blown up to hide evidence, and acts of violence in Berlin including a murder in broad daylight. Last summer Berlin investigators confiscated 77 properties valued at €9.3m which members of the R family were believed to have purchased with the proceeds from various crimes. During the investigation into the coin robbery, prosecutors said that unknown persons had tried to destroy evidence in a vehicle believed to have been the getaway car, which had been confiscated after an illegal car rally. The culprits gained access to a police compound where the car was parked and sprayed fire-extinguishing foam into its interior. But the attempts to hide evidence failed after police found gold deposits on the upholstery. The trial is expected to take about 12 days amid a huge media presence before a chamber of Berlin’s regional court reserved for youth crimes due to the ages of the three men – between 18 to 20 – when they allegedly carried out the heist.